As Mueller's Russia Probe Forges Ahead, Potential Legal Endgames Begin to Take Shape No one on the outside knows what cards Robert Mueller holds, but his actions offer some clues. Here's a look at some of the laws the special counsel might try to use in a potential prosecution. 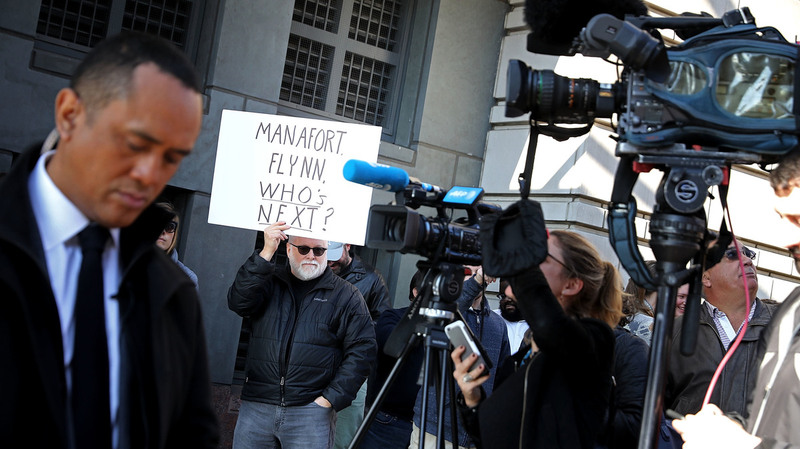 Protesters outside the federal courthouse where Michael Flynn pleaded guilty early this month speculate what is coming next in the special counsel probe. While many aspects of the Justice Department's Russia investigation remain shrouded in secrecy, one thing at this point is clear: Special counsel Robert Mueller isn't finished yet. That raises the question about where he might be heading. Mueller has moved aggressively in his high-profile probe since taking the reins seven months ago. He has brought charges against four people with ties to the Trump campaign or administration so far, including the president's onetime campaign chairman Paul Manafort and former national security adviser Michael Flynn. The outcome of Mueller's relationship with Flynn — who has pleaded guilty to lying to the FBI and is cooperating with investigators — could be the key to what happens down the line, attorneys say. 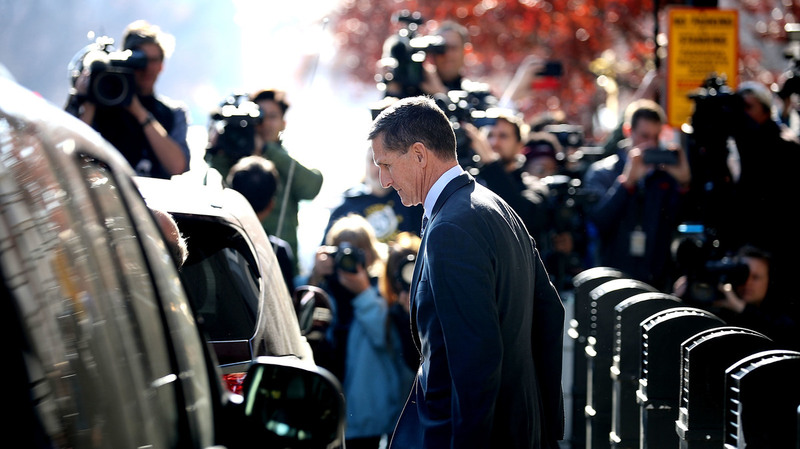 "There are two possible ways this could end up going, and both hinge on why Flynn lied," said Randall Eliason, a former federal prosecutor who teaches white collar criminal law at George Washington University Law School. "Depending on which is the case, you could have very different endgames." If Flynn lied about his Russia contacts because they were deemed politically damaging, then Trump associates — and maybe the president himself — could get caught in a cover-up, even if what they're trying to hide isn't itself criminal. If the facts bear that out, that could mean an obstruction of justice case. For months, news outlets have reported that Mueller is looking into whether Trump obstructed justice, which would amount to attempting to influence or subvert an ongoing investigation. A Trump tweet after Flynn's guilty plea renewed the talk about possible obstruction and fueled questions about what the president knew when he cut Flynn loose in February. Trump said on Twitter that he fired Flynn "because he lied to the Vice President and the FBI. He has pled guilty to those lies." Trump lawyer John Dowd took responsibility for the tweet after it ignited a firestorm, but the White House ultimately acknowledged that Trump knew in late January, before he fired Flynn, that Flynn had probably lied to the FBI. "The president has the right to fire anybody when he wants. But what he can't do is try to interject improper influence in, and impede, an investigation," said Michael J. Moore, a former U.S. attorney now at Pope McGlamry in Atlanta. Moore alluded to the account of former FBI Director James Comey after Flynn's firing. Trump, in Comey's telling, asked him in a confidential meeting at the White House whether he would "let this go." And Trump later fired Comey himself. "That's why that tweet was so important," Moore said. "If he knew at the time that Flynn had lied to the FBI and told Comey to back off, then he's using his position as Comey's superior as leverage to try to achieve an outcome in an investigation — that amounts to obstruction." Obstruction could remain a possible endgame charge in a second scenario as well: If Flynn lied to shield a broader network of contacts between Trump associates, Russians and some nefarious actions they engaged in together. Mueller's mandate from the Justice Department calls for him to investigate "any links and/or coordination between the Russian government" and the Trump campaign. In the popular parlance, that is often called the question of "collusion." But even though "collusion" is a word that has been frequently bandied about, there is no such criminal charge. There is another C-word that could come into play — conspiracy. Depending on the facts developed in Mueller's investigation, there are a couple of options. A Trump tweet after Flynn pleaded guilty renewed the talk about possible obstruction and fueled questions about what the president knew when he cut Flynn loose in February. One potential charge might be conspiracy to violate the Computer Fraud and Abuse Act, says Barak Cohen, a partner and litigation lead at Perkins Coie in Washington, D.C. Mueller's team could reach for that if there is evidence that Trump associates worked with Russia on the hacking of the Democratic National Committee or the emails of Hillary Clinton's campaign chairman, John Podesta. "I think the special counsel would like to be able to charge them as co-conspirators to the hack or accessories after the fact," Cohen said. "It's the most credible and well-established legal theory." If Trump associates weren't directly involved in the hacks but, say, knew about them and kept them hidden, then they could be charged as accessories after that fact, Cohen said. Another theory proffered by John Norris and Carolyn Kenney for the liberal Center for American Progress is that Mueller might try to use the Racketeer Influenced and Corrupt Organizations Act. "More dominoes seem almost inevitable to fall given the special counsel's efforts to secure cooperating witnesses, and RICO statutes give him a powerful card to play if he wishes to do so," they wrote. Or a more general conspiracy charge — to defraud the United States — could come into play, according to Eliason. Conspiracy of this sort means interfering with a lawful government function by deceit or dishonest means. In this case, prosecutors might try to prove the Trump camp had helped pervert the election. "Of course, it depends on what the facts show," Eliason said, "but if one worked with the Russians to leak information and create false social media accounts and other such stuff, that could be conspiracy to defraud the U.S."
What Is Money Laundering? And Why Does It Matter To Robert Mueller? A third possible endgame is some sort of financial crime such as money laundering. "My guess is this is all going to center around money — Russian money," Moore said. Questions swirl around Trump's finances, partly because he has been opaque about his tax payments and partly because of charges by opponents that his businesses are the terminus of a money laundering scheme. This aspect of the story got a boost after reports that Deutsche Bank had received a subpoena from Mueller's team for information on accounts held by people or entities connected to Trump. A lawyer for Trump, Jay Sekulow, denied those reports. The bank itself has made no comment. A Deutsche Bank spokesman told a German business newspaper that it cooperates with official inquiries but does not comment on individual cases. Probing possible financial crimes dating back to before Trump took office and unrelated to Russia could be perilous politically. Trump's aides and Republicans have already argued that such a move would be a step too far for Mueller.